Mysteriously and without warning, three ancient mausoleums have emerged on Ignus. Originally built to honor the mighty Wizard Kings who once ruled the land, these formerly palatial fortresses have since fallen into disrepair. Three savage behemoths, each with an army of twisted monsters at their disposal, have taken hold of the treacherous dungeons. It is said that priceless riches and powerful artifacts await any adventurer courageous enough to banish the twisted evils that occupy the three crumbling strongholds. Will you be so bold? Gear up, rally your allies and keep your wits about you. Fortune and glory awaits only the strongest and bravest heroes! Fight your way through three nightmarish new endgame encounters! From frigid caves of jagged ice to sweeping fields of sizzling lava, each dungeon presents a unique challenge designed specifically for high level party play. Gather a group of friends and prepare for the fight of your wizarding life! Each new dungeon ends in a desperate battle with one of three new boss monsters. These monsters have been given completely unique spells that will force you and your team to communicate clearly and keep your wits about you. Many will challenge them, few will survive. Play and replay the new boss dungeons to earn a variety of all-new epic lootables! We’ve added a slew of new weapon, armor and trinket varieties to the game to make each run of the boss dungeons rewarding and exciting. Among these items are three new sets of extremely powerful armors and weapons that can only be earned by slaying the mighty bosses themselves. This massive update also includes a number of gameplay tweaks, bug fixes and visual improvements. 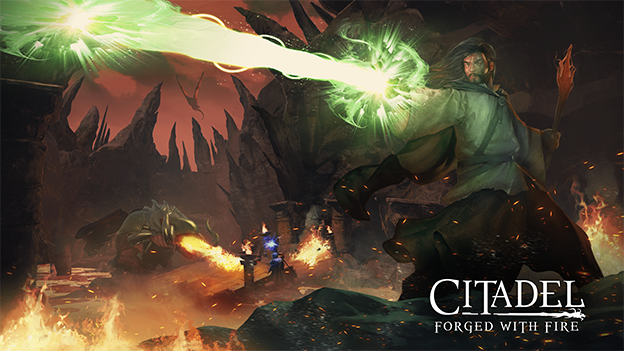 Combined with the content we’ve released since launch – new structure pieces and functionality, tons of new creatures, weapons, armors and items, new spells , server optimizations and new gameplay systems – Citadel is now the best it’s ever been! Yes, believe it or not they are adding content to the game while it’s still in Early Access!! That’s blasphemy! So, you release an expansion for game that hasnt even cleared alpha stage? WTF get real.